Coming Soon- Thought Bubble 2012. I’m rather pleased to say that I’ve managed to get myself a table for this years Thought Bubble gig, up in Leeds in November. This will be my fourth time at the most varied convention in the UK, and I’m very much looking forward to catching up with friends both old and new. Comics wise I’ll have new issues of both FutureQuake (22) and Something Wicked (08) as well as the latest issues of Zarjaz and Dogbreath, too. Drop by and say hi! Comics wise I’ll have new issues of both Zarjaz (16) and Dogbreath (26) as well as the latest issues of FutureQuake and Something Wicked, too. Drop by and say hi! Coming soon- ANDERSON, PSI- I, DEATH! Crikey! Looks like Cass is having a rough time collecting her perp from the build-a-synthi-bear-factory outing for distubed juves! 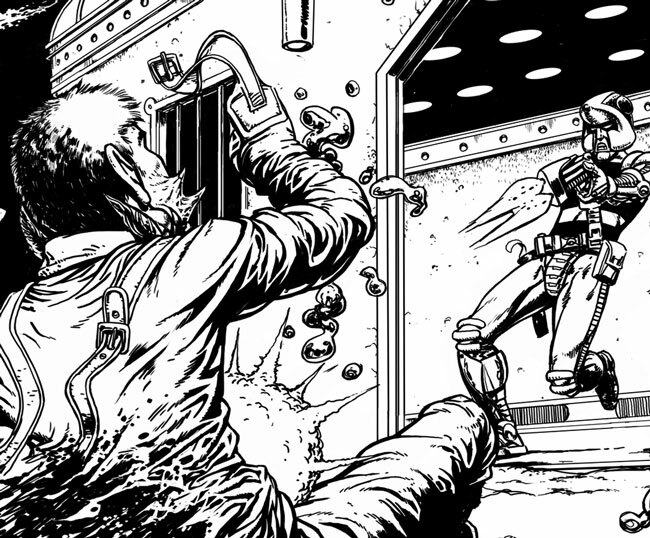 Find out what happens next in I, DEATH by Lee Robson and Dunk! Nimmo. On sale in Zarjaz 16, due in November 2012. WTF? Why the sneck is Johnny shooting a man in a straightjacket? Is he a mentalist Kreeler, out for revenge? Is he smuggling Gronks off world for hungry gourmands? Whatever his crime, you can be sure that Johnny is totally justified in his actions. Find out what the sneck is going on in RILEY’S COLLAR, by Derek Hamill and Jon Taylor when it goes on sale as part of Dogbreath 26. Look for it at the Thought Bubble Convention in November! Just what in the name of tarnation is going on here? Maybe writer Alec Charles and artist Jared Souza call tell me? You’ll be able to find out in EVOLUTIONARY PSYCHOLOGY, in FutureQuake 22. On sale in November and available at this years Thought Bubble Convention. Got a bit of time to prime you folk out there for this. You’ve all read DARK JUDGEMENT, right? Well at Bristol 2011 I was asked by artist ROLAND BIRD if he could have a Judge Death story to draw? Well, says I, I’ll have a word with a chap I know who might just be able to help you out. 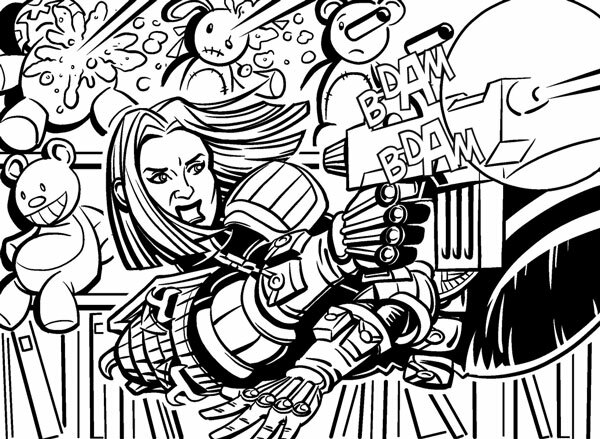 Enter Rich McAuliffe, who runs the Everything comes Back to 2000 AD blog and podcasts and stuff. That very evening, over my first and his not first beer of the night, I asked him about a script for roland. No worries, Say Rich, I’ll get right on it. Three months later I sent him an email to remind him of this conversation. However, when he did deliver- he delivered. This strip is so good that we are going to be developing a whole new special to contain it. Custom, bespoke thril containment and delivery vessels are being designed to house this strip, and the others that will make up the as yet untitled special. 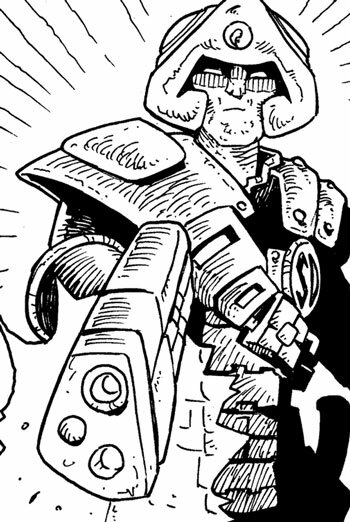 Coming to Dogbreath 26, Strontium Dog- Wolves by the team of MJ Howard and David Broughton. This is Davids first proper foray into the world of Johnny Alpha following on from his help with last issues text story. Dogbreath 26 will be on sale in November and available also at the Thought Bubble Expo! We’re just too good for you, Norms!